I like a good party. I always have. Probably because I could befriend most anyone even at the age of six. So it goes without saying that when it comes to being gifted, I just happen to have the gift of gab. During the holidays I always manage to have some sort of gathering, so this year I started to piece together my plans for hosting a winter solstice gathering. When winter arrives I can't help but get hung up on simple touches that make my abode feel more festive when I have guests over. However, having a holiday bash doesn't mean you need to hire a gourmet chef or professional decorator. I'm a firm believer that you don't have to break the bank to prep your place for guests. Have everyone bring their own beverages and an appetizer to share. That way you will have a spread of treats without hours of prep time on your part. A common mistake made when entertaining is the perceived notion of needing an abode covered in holiday scents. Some overcompensate by doing a veritable crop-dusting of room spray around the house to ensure that every square inch is scented. Like I said, mistake. You don't want your guests to have to wear gas masks to get through a cloud of holiday scents, so take it easy on the room spray. 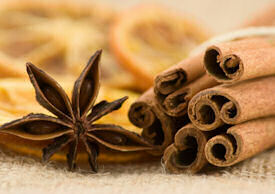 A more subtle and more natural approach is to make a simmering pot of wonderful spices. Its as easy as filling a pot with water and some of your favorite spices, then let it simmer all day. There really is no wrong way to mix ingredients together -- the success is in finding what mixture works best for you. An extra perk is that it can also humidify your room during dry winter months. Another small touch is to switch out your bathroom soap and candles around the house to holiday scents. My go-to scent for years now has been Frasier Fir by Thymes. 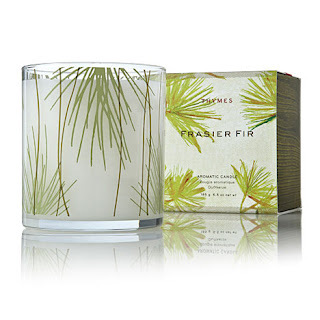 It is the most authentic-smelling holiday candle/soap collection I have found to date. I also appreciate that their products are locally made and are essential oil-based. Now to tackle the uphill battle that is my holiday shopping list.